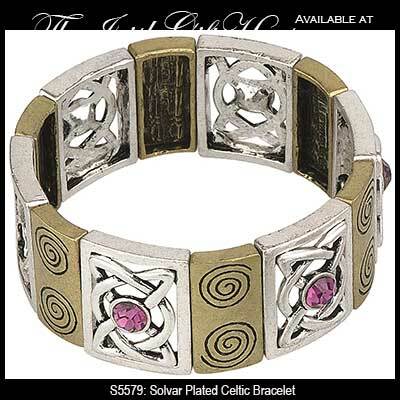 Celtic bracelet is a wide design that features gold tone spiral links along with silver tone knot links. This large metal Celtic bracelet features embossed gold tone spiral links along with alternating silver tone open knot-work links that are enhanced with amethyst color glass stones. The Celtic stretch bracelet, with 1" tall links, has a 7" circumference and fits most women's wrists as it is expandable. 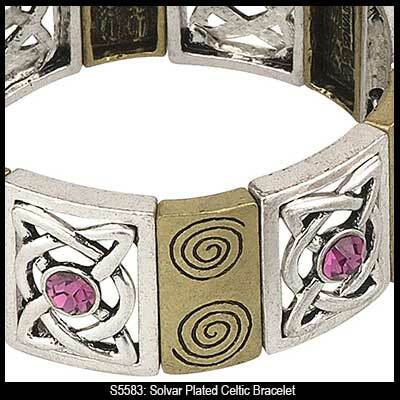 The Irish bracelet is complete with Celtic spiral and Celtic knot history cards that are complements of The Irish Gift House; it is made by Solvar Jewelry in Dublin, Ireland. This heavy Celtic necklace features gold tone knot-work along with an amethyst color glass stone.